Happy Monday!! If you follow me on twitter/ Instagram/ etc, you might know that I am currently out of town visiting my best friend in Chicago. I'm so excited to show you pictures!! To start off, during my first day here my bff took me to her favorite cupcake spot, Molly's. It was sooooo delicious! I loved how my pastel outfit went with the cupcakes!! Especially the color of this necklace from Pop of Chic, I'm so obsessed with it that as a token of my appreciation to you, today I bring you my very first giveaway. Who better to do it with then with Pop of Chic!? 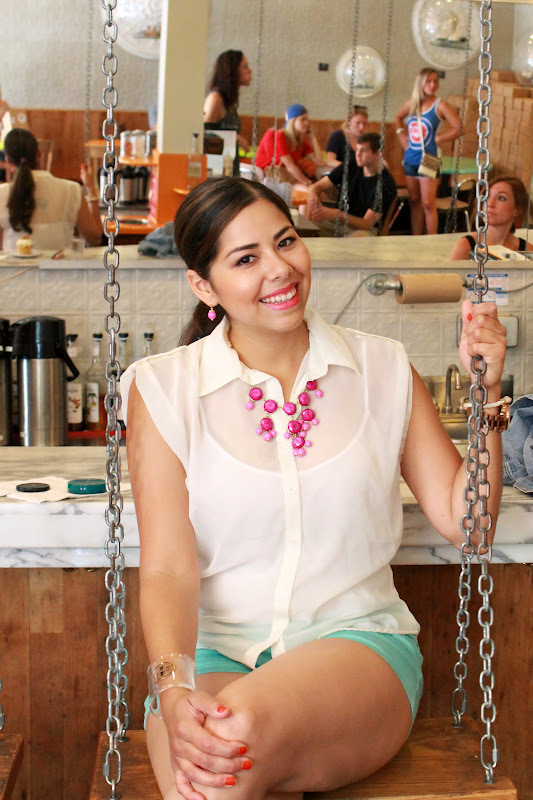 Cynthia is a local latina businesswoman who sells gorgeous jewelry on popofchic.com. Her pieces are always sophisticated, colorful and did I say gorgeous?! This necklace also comes with the matching earrings!! See details below to enter the giveaway (I tried to make is as simple as possible!). Also, If you win this necklace and send me a picture of you wearing it, I will be happy to feature you on my blog! Thank you for reading & thanks for participating! Super cute! Love the necklace! I hope you have a great time in Chicago Pau and these pics are adorable. Something about cupcakes always are so cute in posts. I've been hearing a lot about a Pop of Chic lately and this necklace really is gorgeous. I already follow you on everything so I liked their page and can't wait to see your Chi town pics. 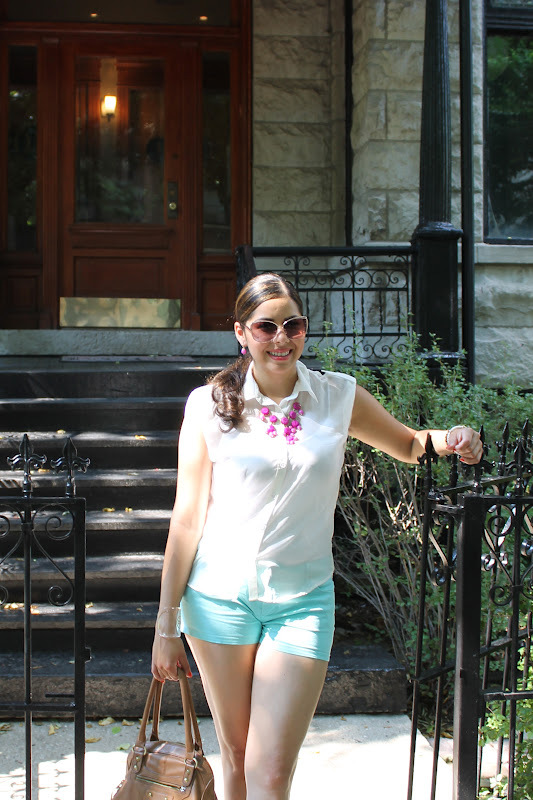 You look really pretty in your mint shorts with the chic pony tail too! girl, you look absolutely great! I think it's brilliant how you've combined the classy and elegant shirt with those casual sneakers. simply love it!! The necklace rocks the outfit...such a great color! Yay for your first giveaway! I follow you and Pop of Chic on Facebook, Twitter, and Instagram. You look lovely and that cupcake looks yummy. Love the set! :) New follower. 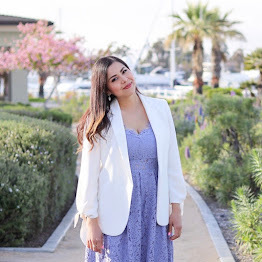 Found your blog through Pop of Chic! I am now following you via GFC, liked your page on facebook and I already like Pop of Chic's facebook page. Hey, I found your blog through Pop of Chic's twitter post. Love your blog, and I can see you also enjoy cupcakes as I do =).. Those look delicious! I am following you now, let's stay in touch. following pop of chic on twitter! follow pop of chic on instagram! did all the mandatory entries! Love this look! Hope i'm the lucky winner! following you and liked the fb pages! 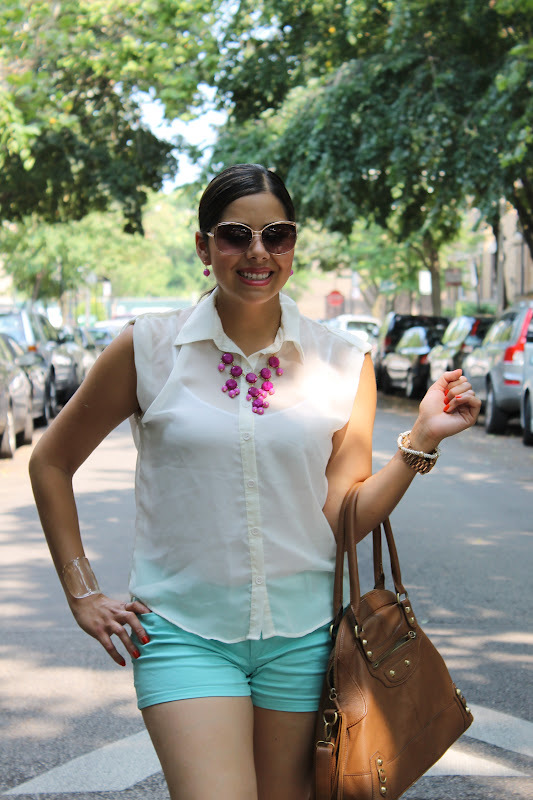 love the way you accessorized this sporty and stylish combo! i liked lil bits on chic on facebook. i liked pop of chic on facebook. I did all the mandatory entries, plus followed you and Pop of Chic on Twitter (@rachellerae). HI, please enter me for the giveaway. I have fulfilled ALL the required and extra entries!! Hi Paulina! 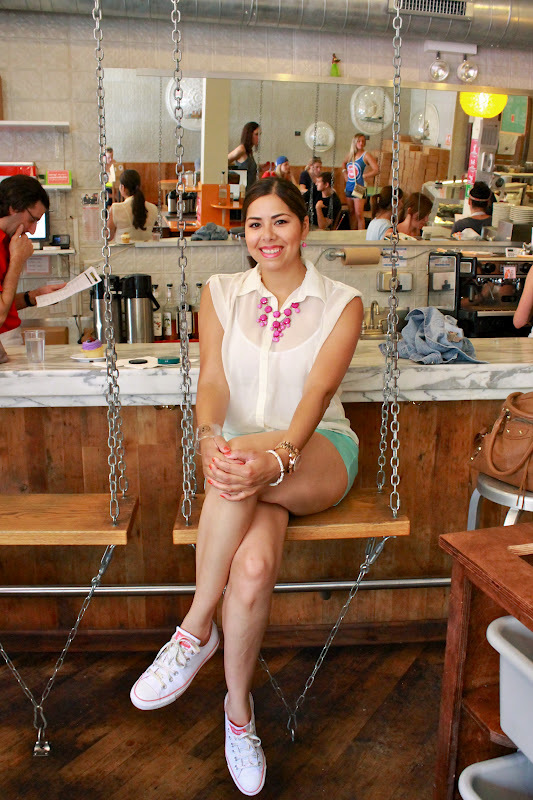 I love your style and I ADORE that necklace! I am following your blog through GFC as Krys Black. I liked Lil Bits of Chic and Pop of Chic on Facebook as Krysten M. Black. I have followed you and Pop of Chic on Twitter as @bingturtle. That is a total of 5 entries! Fingers crossed! That is such a gorgeous necklace! I follow via GFC- M.P.